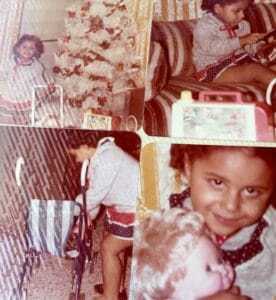 Me as a tween on a Christmas morning surrounded by the gifts Santa brought me. Once upon a time…. As a child, I wanted to play smart and get Santa “in the act” of placing my gifts under our Christmas tree. On the night of that December 24th, I decided I was going to sleep in the living room. My mom went with it for awhile – even taking pillows and blankets to the sofa – but when she mentioned the common occurrence of lizards in the living room, I quickly changed my mind! I was convinced Santa Clause came to my house in Arroyo, Puerto Rico every Christmas Eve until I was 10. But, technically, my parents kept playing Santa until I was 12. “But its soooo expensive!” To which I then replied “Oh but it’s free!”And that was it. The truth was out. She proceeded to spill the magical story that Santa was really my parents, who bought, wrapped & placed the gifts under the Christmas tree. If I had heard this recounted a few years before, I would have run crying to my parents in the hope that they would have told me it wasn’t true. But here I was at age 10…in the prime tween years when you are still a naive child, but old enough to “understand” implications. So instead, I chose to be quiet. Yep! A whole two Christmases exactly, when I hid the fact that I knew the truth! Yes, I was a spoiled only-child who made 15-item lists that I mailed every year to the North Pole, including a pretty good pitch of what a good girl I had been all year. So it was in my best interest to keep the magic alive. I wondered whether my parent’s plan wouldn’t have lasted that long if I had older siblings. 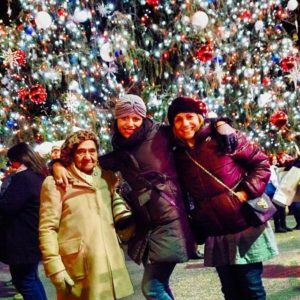 Me with grandma and mami in front of Bryant Parks Christmas Tree in NYC. d to 10…. and then to 16, as I now live in NYC. Wow time truly flies! Since then, the holidays have been a much-anticipated event, which I plan with mami y papi months in advance. The magic now doesn’t include Santa, but it’s more about quality time with la familia. It’s about the time when we get to spend a prolonged time together versus just a weekend visit. It’s the time when mami gets to visit NYC, which she describes as “la verdadera Navidad,” due to the winter clothing, the ice-skating and the Rockefeller Tree. She looooves it. “Parece una postal….Como en las movies,” she says. Lechón asado and arroz con habichuelas. Check! Coquito and arroz con dulce. Check! Traditional holiday food in PR is really something else. But the food, the gifts and the parrandas are really the icing in the cake. The holidays for me are about family, friendship….and vacations. I’m blessed to have such amazing parents that not only did (very) good keeping the Christmas magic alive as long as they could, but continue #DoinGood every single holiday….and every single day. Now I ask you: With the holidays approaching, are you thankful for your parents after witnessing how good they are at maintaining the family traditions? Give them a shout-out in the comments below and remind them how they are #DoinGood, even if they don’t see it all the time. 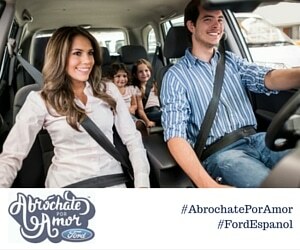 This entry was posted in For Mothers & Tias and tagged Anllelic Lozada, Being Latino, DoinGood, gratitude, Hispanics, holidays, Latinos, Minute Maid. Bookmark the permalink.